Diogo Aguiam is a staff researcher in the Microfabrication and Exploratory Nanotechnology group at INL contributing to the development of electronic instrumentation, embedded systems and data processing techniques. He has an MSc in Electronics Engineering from Instituto Superior Técnico where he worked on a standalone embedded system for eddy currents non-destructive testing of faults in metallic parts. He obtained a double PhD in Engineering Physics from Ghent University and the University of Lisbon, where he developed microwave reflectometry diagnostics for nuclear fusion plasma electron density profile measurements. During his PhD, he worked between the Instituto de Plasmas e Fusão Nuclear in Lisbon, Portugal, and the Max-Planck-Institute for Plasma Physics in Garching, Germany, where he collaborated in large international teams, and was responsible for diagnostic maintenance and development of data analysis software. 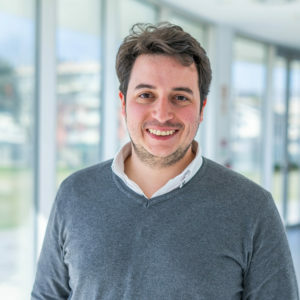 Diogo is an advocate for open science and participated in the Mozilla Open Leaders with the OpenReflectometry open source Python package. He is a Software Carpentry instructor and has given computing & programming workshops to other researchers. Aguiam, D. E., Silva, A., Guimarais, L., Carvalho, P. J., Conway, G. D., Goncalves, B., … Tudisco, O. (2018). Estimation of X-Mode Reflectometry First Fringe Frequency Using Neural Networks. IEEE Transactions on Plasma Science, 46(5), 1323–1330. Aguiam, D. E., Silva, A., Bobkov, V., Carvalho, P. J., Carvalho, P. F., Cavazzana, R., … Tudisco, O. (2017). X-mode raw data analysis of the new AUG ICRF antenna edge density profile reflectometer. Fusion Engineering and Design, 87(11), 7–10. Aguiam, D. E., Silva, A., Bobkov, V., Carvalho, P. J., Carvalho, P. F., Cavazzana, R., … Tudisco, O. (2016). Implementation of the new multichannel X-mode edge density profile reflectometer for the ICRF antenna on ASDEX Upgrade. Review of Scientific Instruments, 87(11), 11E722. Aguiam, D. E., Rosado, L. S., Ramos, P. M., & Piedade, M. (2015). Heterodyning based portable instrument for eddy currents non-destructive testing.